We’re reminding pet owners they have until the end of the month to act if they intend to travel to the European Union (EU) with their furry friend from the end of March. Roberta Duncan, our clinical director, is urging pet owners to be organised with their preparations for foreign travel, should the UK leave the EU without a deal. 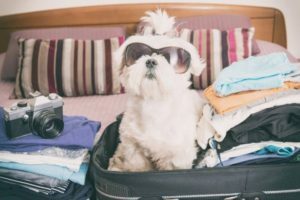 Currently, dogs, cats and ferrets can travel anywhere in the EU as long as they have a pet passport, which sees owners take their pets to an Official Veterinarian (OV) three weeks before a trip to be microchipped and vaccinated against rabies. However, the Government has issued a paper preparing for a possible No Deal Brexit, in which it advised pet owners wanting to go abroad after March 30 that they have to take their animals to an OV at least four months before travelling – meaning the end of November deadline is fast approaching. Roberta said: “The turnaround for organising microchipping, vaccinations and a pet passport has always been relatively short but the Government has now warned that, with no EU deal, pet owners may have to visit their OV as early as the end of next month for an April trip abroad.